Fulbright U.S. Student Jesse Appell in Beijing. Photo courtesy of Carole Lauener. By now you may have heard of Jesse. He created “Laowai Style,” a video parody of Korean rapper PSY’s “Gangnam Style” (a “laowai” is one of several Chinese words for “foreigner”). To date, Jesse’s version has been viewed over 1 million times on Youku (China’s most popular video hosting website) and over 70,000 times on YouTube. 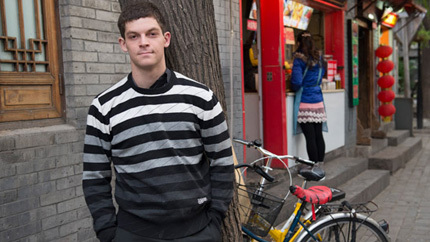 The video, which was created while Jesse was living in Beijing and preparing for his Fulbright, depicts the daily life of a foreigner in China. Which brings us back to Jesse’s recent claim to fame, “Laowai Style.” “Chinese people don’t think laowai can live life like Chinese people,” Jesse said. In the video, Jesse sang about how he, as an American in Beijing, has many things in common with Chinese people – his choice of food and drink, his knowledge of shopping and walking in the city, his money-saving choices in his cell phone and transportation purchases. “I like the idea of trying to erase … preconception[s] by having some of my lyrics be about ‘I’m the kind of foreigner that doesn’t drive a BMW, but drives instead an electric bike.’ [I like] showing that foreigners live like Chinese people,” he said. The video has attracted international attention since it first hit the internet. To date, Jesse has done interviews with several media outlets and bloggers, including the NPR News Hour Blog. And yes, that means he’ll be making more videos – so stay tuned.